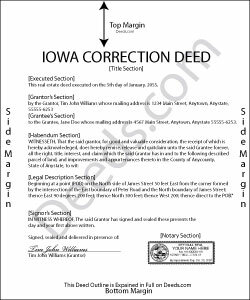 In Iowa, use a correction deed to amend a previously recorded deed that contains a minor error. A corrective deed is, in effect, an explanation and correction of an error in a prior instrument. As such, it passes no title and, except for the corrected item, reiterates and confirms the prior conveyance. It should be executed from the original grantor to the original grantee, and it needs to be recorded in order to be legally valid. The correction deed must reference the original conveyance by type of error, date of execution and recording, as well as by recording number and location. Beyond that, it restates the information given in the prior deed, which remains on record and receives a cross-reference to the corrective instrument. Deeds of correction are most appropriate for minor errors and omissions in the original deed, such as misspelled names, omission of marital status, or typos in the legal description. More substantial changes, such as adding a name to the title, changing the vesting information or the legal description of the property, may require a new deed of conveyance instead of a correction deed. Correction deeds are exempt from state revenue tax pursuant to IRS 428A.2 (10) that exempts "deeds which, without additional consideration, confirm, correct, modify, or supplement a deed previously recorded." The exemption needs to be identified on the deed itself, or the declaration of value form must be submitted with the deed. Ardelle P. said: Extremely happy with this. Easy to use and very professional looking form when completed.